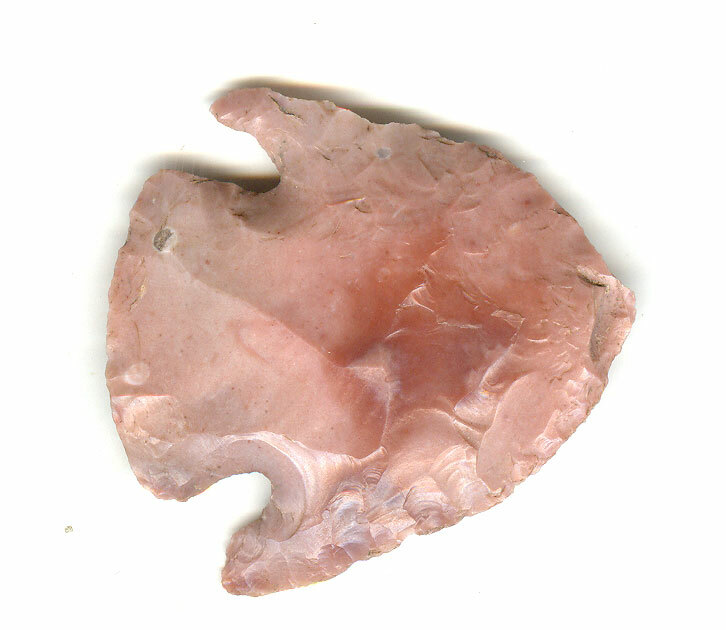 A Small Size, Very Colorful, Anciently Use Sharpened And Visibly Aged, Typically Made, Big Creek Point That Exhibits Stone Sheen And Surface Coloration Aging Patination, Aging In The Corner Notches, Evident Ancient Blade Sharpening Use Reduction, Aged Surface Deposits, Correct Style Tip And Drooping Tangs, Correct Material And Manufacture For The Area Found. Purchased At The Alamo Village Movie Set Sale, Near Brackettville, Texas On January 27, 2018 By Ignacio Sanchez. This Highly Collectible Example Was Displayed In A Frame, At The Alamo Village Movie Set Location For Years! Includes A Ken Partain Certificate of Authenticity.